Mother-in-law and daughter-in-law are forever foes. Two women can not get well with each other under the same roof. There is a perception that mother-in-law and daughter-in-law are forever foes. It is impossible for two women without blood ties to be like natural mother and sdaughter. A counter perception is that it isn’t hard to deal with the mother and daughter-in-law if the two women really love the man ( one’s hushand, the other’s son)? 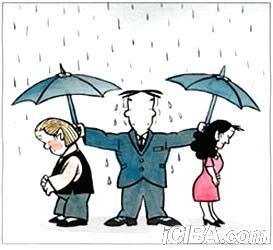 The man must be a good coordinator between his wife and his mother? All these are just perceptions on paper. In reality, most of mothers-in-law and daughters-in-laws act like forever foes. Don’t they know how hard it is for the man stuck in the tangled relationship? From what I've seen you are right. My mother disliked my grand-mother and always complained that my grandmother didn't share some cooking recipes with her! My wife does not like my mother and will not talk to her on the phone without coercion. It seems that a wife will take the attitude that the husbands first priority is to her ( the wife) and the mother has no claim on her son anymore. In Chinese big cities, parents don't live with their married children. Parents have their own pensions and they want free space after retirement. While some youge married couple continue expoiting their old parents like letting old parents acting as baby-sitters and letting them cook and never pay. They treat old parents like volunteer labors! Its not always true of always being foes. Love involves only two people, but marriage involves two families. “Love me, love my family members” is always easy to say than to do. Beijing a man, the toughest time might be the moment when his mom and wife have a quarrel. Marriage is a big change for a girl and her future mother-in-law. Two women become connected for loving the same man. It is a big change for a girl to become someone's daughter-in-law. She has to call a stranger "Mother" who has never raised her for a single day and has no blood tie with her. Is it easy to accept her? To the man's mother, it is also a big change. Cause she brought up her son and gave him all her love but finally he loves someone else, she has to share the love with a young girl who captured her son's love. It must be unbalanced in the mother's mind. Post a Reply to: Mother-in-law and daughter-in-law are forever foes.